On Friday evening I had plans to meet Elle from A Fast Paced Life for dinner in Glen Mills, PA. After years of following each other’s blogs, I was really looking forward to meeting Elle in person. We would have had a delicious dinner, taken lots of photos to document the occasion like good little bloggers, and then ended our evening early in preparation for the next morning’s race. 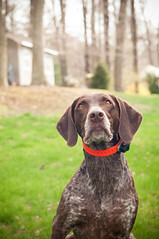 Saturday morning was the big event and the real reason Elle was making the long drive down from Brooklyn. At 9:45 Elle and I would meet again, this time on the streets of Wilmington for the second annual Delaware Downhill 5K. 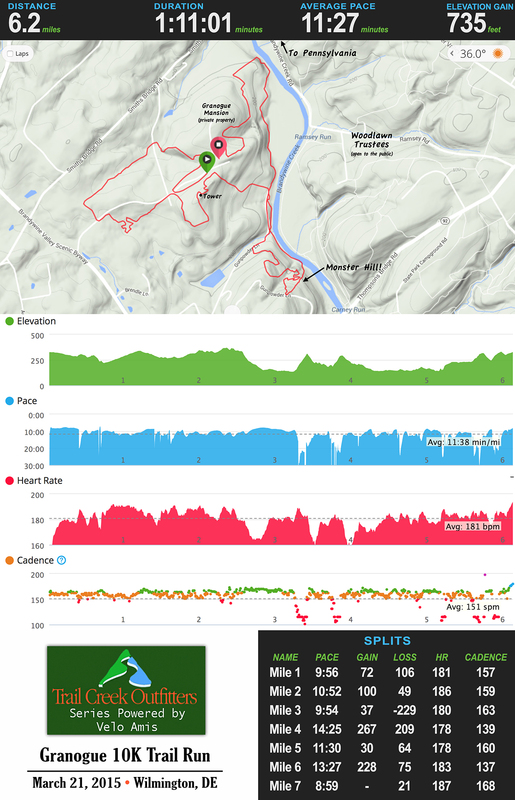 The point-to-point course had an elevation drop of over 200 feet, guaranteeing a fun, fast 3.1 miles. Elle and I have both been running personal bests lately and we both hoped to walk away with new PRs. I was PSYCHED for my downhill duel with Elle and I had the whole race planned out in my mind. I would run the first mile in 7:03, the same pace that I ran the first mile of the 2 mile Jingle Elf Run two weeks ago. Then I’d give into the downhill in mile 2 and aim for a sub-7 (!!) split. Finally, with a relatively flat final mile ahead of me, I would hold on for dear life, trying to keep up with Elle who is in BQ-marathon-shape and who certainly would have more strength in the final mile than I. Elle and I would cross the finish line together (ok, maybe I’d edge her out by a second, this is MY version of the story after all!) and we’d both drive home happy with our huge 5K PRs. But none of that actually happened. Nope, Mother Nature had other plans so we had to adapt. Friday morning I woke up and the first thing I saw was a “Winter Weather Advisory” on my phone. Winter weather? When I went to bed there wasn’t any snow in the forecast. Apparently the models changed overnight and, just like that, we were now supposed to get 2-4 inches of snow right in the middle of the evening commute. I immediately thought of Elle and sent her a quick message. Elle replied that she used to live in Canada and wasn’t scared of a little snow. Our weekend was still on track. I worked all day Friday, happily watching the beautiful snow fall quietly on the cars in the parking lot outside my window. It wasn’t until 4:30PM when Matt and I left work that I realized how MUCH snow there really was. The roads were not treated at all and traffic was terrible. Our 5 minute commute took 20 minutes and, after watching a truck go off the road ahead of us, I decided that there was no way I was voluntarily going back out on the roads after dark. I sadly texted Elle to cancel our dinner. At least we’d get to see each other the next morning! Saturday morning started like any race morning. I woke up really early, ate breakfast and hung out with Piper while we waited for the sun to come up. But then at 6:57AM I received an email: due to icy conditions the Downhill 5K was POSTPONED until Sunday! I could run Sunday but I felt terrible for poor Elle, who had driven all the way to Delaware in a snowstorm only to have dinner AND her race cancelled! But we salvaged the day. 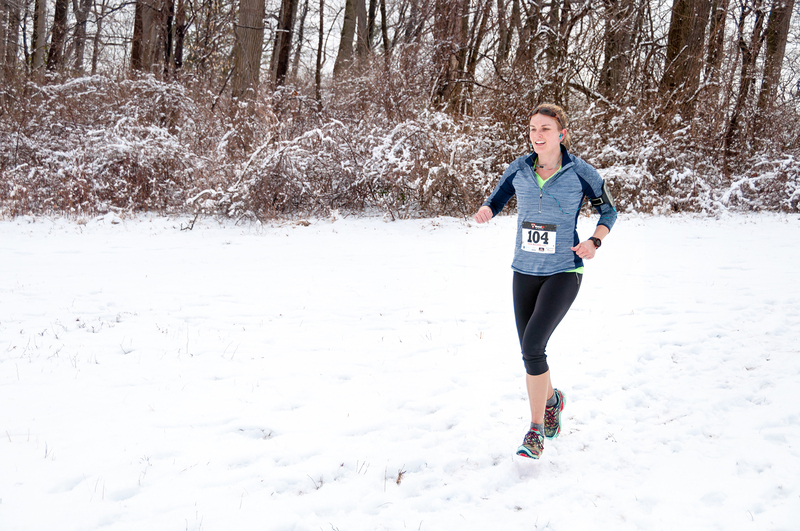 Instead of racing downhill in Delaware, Elle met me at Okehocking Preserve for a snowy, hilly trail run. And it was perfect!! (Much less pressure than a downhill duel, I must say.) 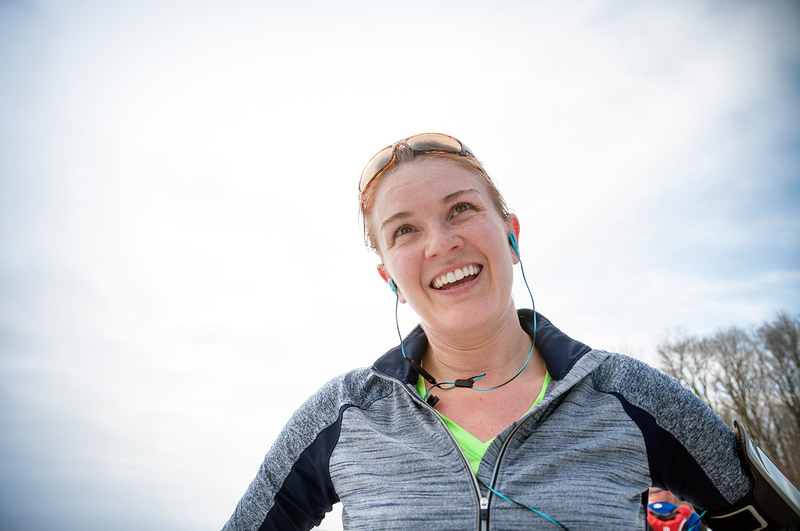 We crisscrossed our way around the preserve, chatting non-stop about our dogs (Piper and Bandit need to have a showdown one day, we decided), our running habits, and our lives outside of the blogosphere. After our run we enjoyed a long brunch together before Elle set off on her journey home. It was such fun to meet Elle and I loved getting the chance to show her my local running trails, even if we didn’t get to race one another. Now we have an excuse to meet again at a future date for a second attempt at our duel! I thought that the surprises were over but the weekend had one more for me. Saturday afternoon I got another email from the race organizers, this time to say that Sunday’s course was going to be modified to just be a flat out and back. So no downhill, no 200 ft. of elevation drop, and no inevitable PR. Boo. But I was still going to give it my best shot. I woke up before the sun for the second weekend day in a row. 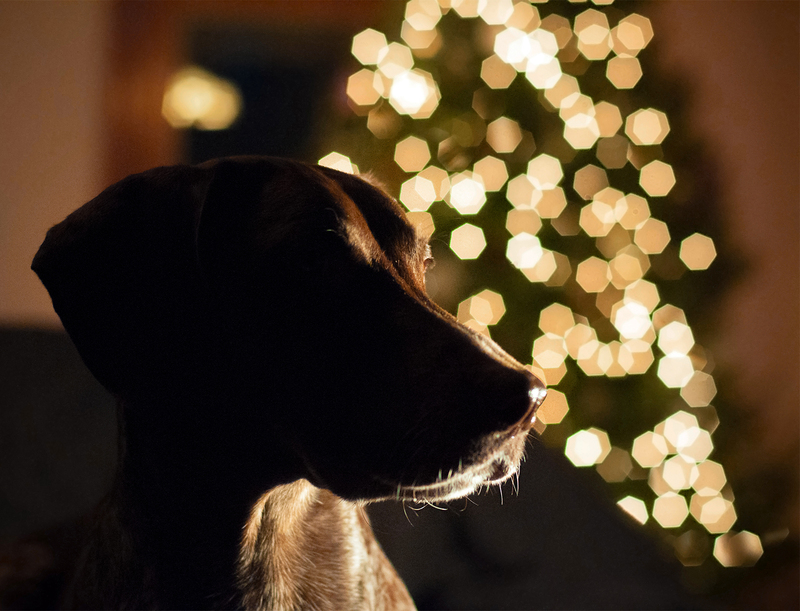 This is proof – a predawn Piper pic in front of our Christmas tree. 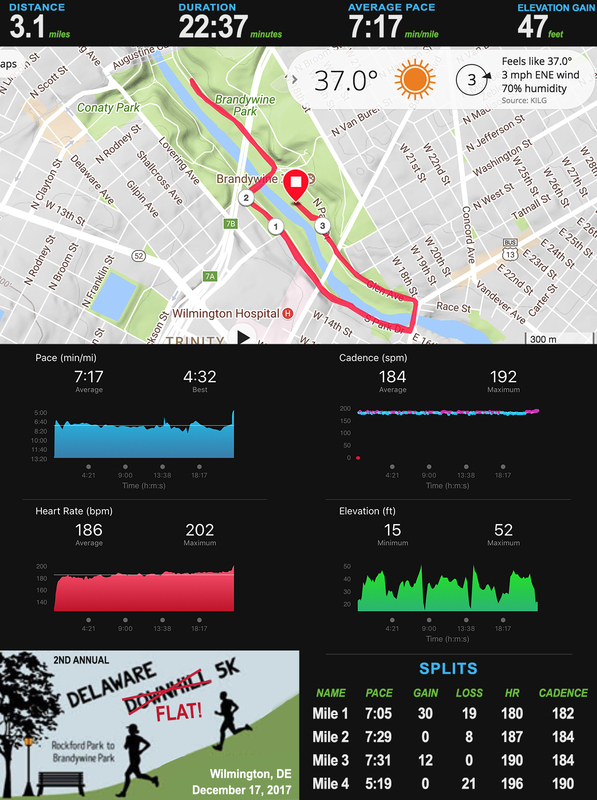 I scoped out the first half mile of the course during my warm up and immediately noticed that there were several slight hills along the route, mostly thanks to the bridges that we’d cross back and forth over the Brandywine River four times. Fortunately the final half mile looked like it would have some gentle downhill, which always makes for a more exciting finish. 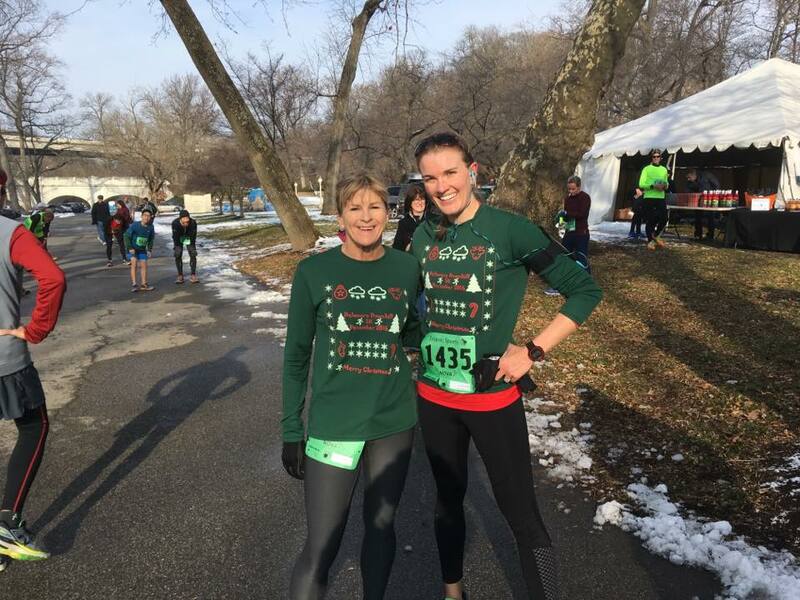 My race plan wasn’t especially well thought out – I had focused on preparing for the downhill course and didn’t really adjust my plan for the new flat-ish course. As a result I went out way too fast in the first mile, clocking a 7:05 split. Oops! I still felt good in mile 2, but realized my mistake when my Garmin beeped a 7:29 split. I hung on for mile 3, waiting to reach that final bit of downhill. A woman had been ahead of me for the whole race and I had been gaining on her ever so slowly as the seconds ticked by. Finally the slight downhill began. (It sure felt like more of a hill when I was going up it at the start of the race!) I had to make a decision: should I really push myself and try to chase her down, or was she too far ahead to reach? I went for the push and surged forward, moving up close enough to her that a spectator in the homestretch started yelling, “SHE’S RIGHT BEHIND YOU! GOOOO!! !” The woman sped up but by then I had already made up my mind. I sprinted by her and kept sprinting as hard as I could through the finish line. Got her! I finished in 22:37, one second faster than my time on the actual downhill course last year. I later realized my final push to the finish was definitely worth it. Unbeknownst to me, another woman in the 30-39 age group was right behind me, finishing with a chip time of 22:41. If I hadn’t sprinted I wouldn’t have placed in my age group. (That’s why you always sprint at the end of a chipped race… you never know how close the finish might actually be!) My prize was an ugly Christmas sweater for a wine bottle. I’m sure it will get some good use over the holidays! Let it snow! Long enough for a run, at least. We experienced some very odd weather in southeastern Pennsylvania yesterday… it snowed! 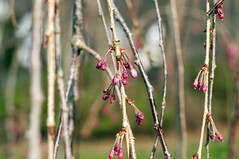 And not just cute little spring flurries. This was real, accumulating, white-out conditions SNOW! 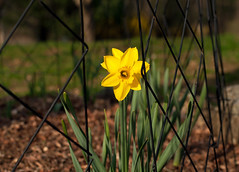 The storm started mid-morning and dumped 4-5 inches on my daffodils, budding trees, and sugar snap pea shoots. There was nothing I could do to protect my garden so I decided to take Piper out for a trail run at nearby Okehocking Preserve instead. 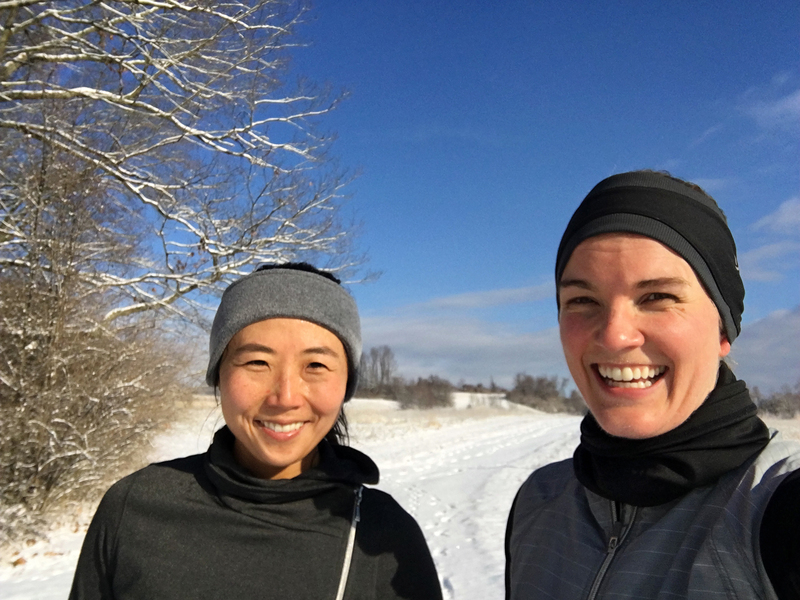 We ran a big loop around the preserve, enjoying the muddy trails, slippery hills and snowy grass. This might have been a freak storm, but it sure was pretty! I brought my Go Pro along and had fun running towards it on the trail. Matt gave me the Go Pro for my birthday last November and I’m still learning how to take advantage of the tiny camera’s super wide-angle lens and various shooting modes. Yesterday I played around with the Go Pro’s continuous photo mode and tried to avoid stepping on it each time Piper and I zoomed by. Luckily no one else was out in the storm to witness this behavior… Piper thought we looked pretty silly. The storm ended at 5PM and immediately started melting. Our backyard is still blanketed in snow more than 24 hours later, but the temperature is supposed to rise to 62°F tomorrow so the snow should disappear soon. As much as I enjoyed my winter romp with Piper, I’ll be OK if I don’t see another snow flake until November!! Matt and I returned home from Sedona to a snow-covered Pennsylvania. The snow was so deep on our driveway that we could barely walk up it (suitcases made that even more challenging). 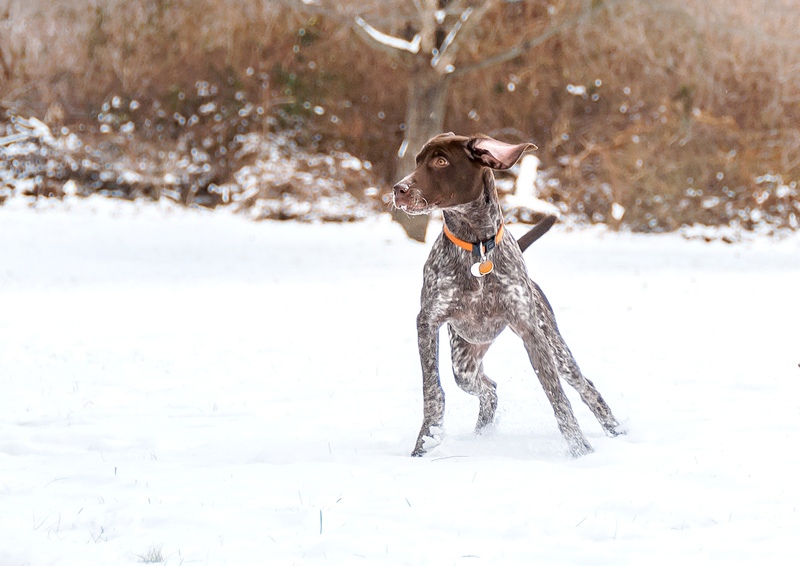 Piper resorted to bounding gazelle-style across the backyard, leaping up and over the snow with every bouncing stride. The snow was beautiful but definitely not easy to get around in. 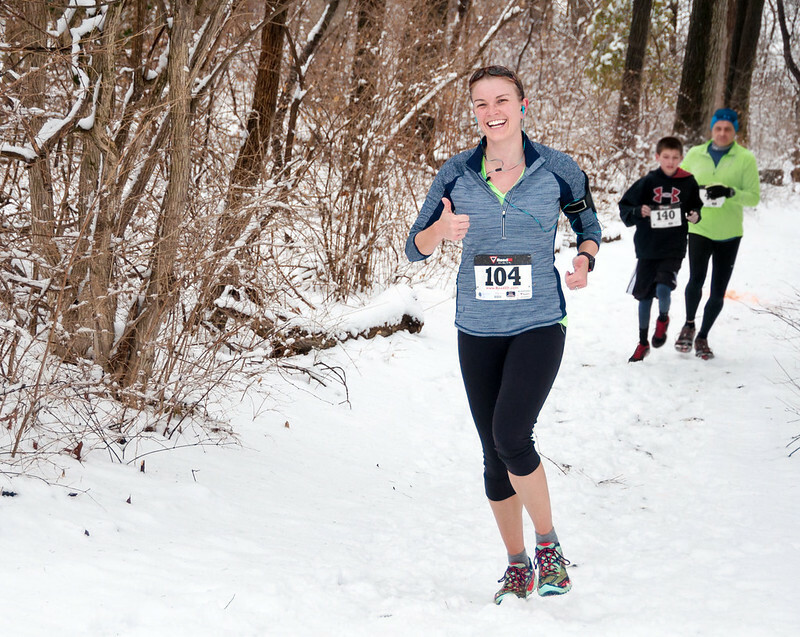 With that in mind, the last thing a sane person would do is sign up for a trail race the following Saturday (yes, a TRAIL race, in the deep snow!) but apparently I must have still been on a vacation-induced high because on Wednesday I found myself typing in my credit card details on RunTheDay.com for a a last-minute registration to the Pickle Run. I think I was imagining that the trails at Ridley Creek State Park would have somehow been groomed or otherwise packed down by snowshoers or something like that, but oh boy, was I wrong! I arrived at the park on Saturday morning feeling totally ready for a trail run. 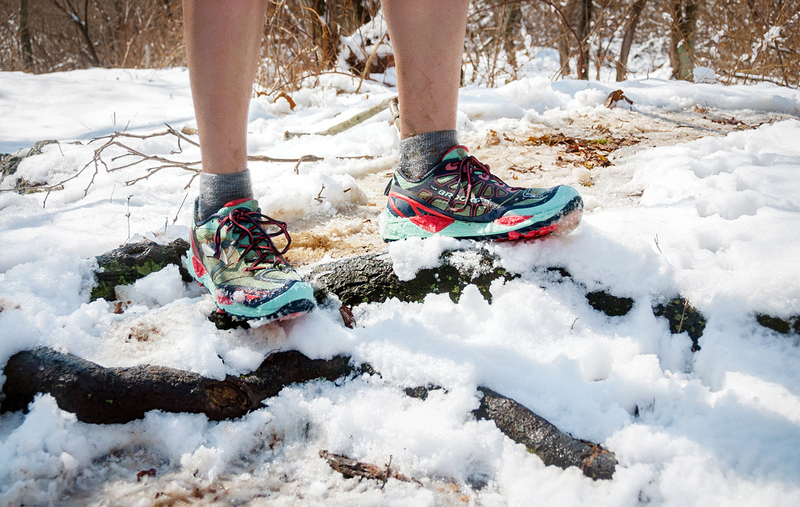 I was wearing my trusty Brooks Cascadia trail shoes with Yaktrax strapped over them for optimum traction on the snowy terrain. Like all Pickle Runs this was a prediction race so I conservatively guessed that I’d finish the “3.4ish” mile course in 36 minutes. The first half mile of the race was on pavement and I click-clacked along in my Yaktrax, feeling like I was making great time. Then the trail picklers veered off from the road-runners into the woods. 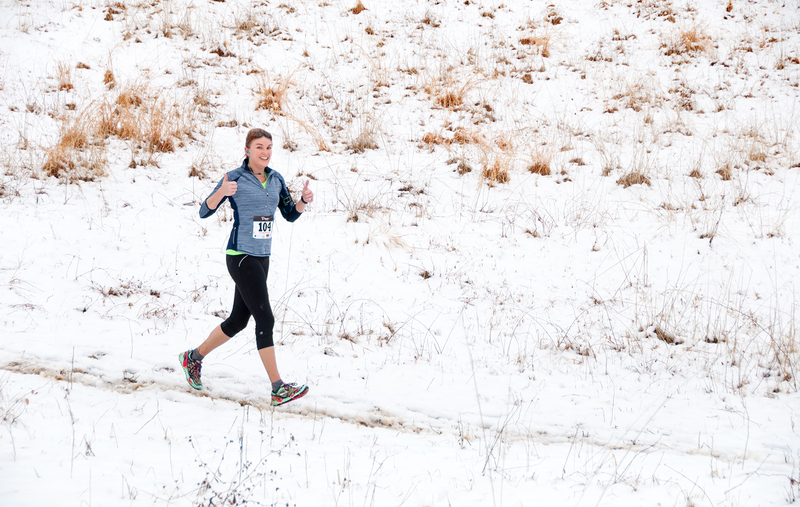 For several strides we were on a dirt path – easy enough – but then the course marker pointed us off the path, over a drift, and into the snowy wilderness. I took my first steps in the snow and felt my feet sinking and ankles bending every time I hit a foot hole made by runners ahead of me… this was going to be HARD! The deep snow and random divots were soon joined by a single set of cross-country ski tracks. Initially I thought they would make the trail better, but it took about 2 seconds for me to realize that my feet are much wider than a ski and the tracks only served to create two continuous, foot-busting trenches straight down the middle of the path. Ouch ouch ouch. During this first mile in the woods a few runners passed me. I was seriously impressed that they were able to move at any pace faster than a slow, careful crawl and happily told them all “good job!” as they trudged their way around me. I kept thinking that I should be able to find a set of footprints and run in them, but that just wasn’t happening… maybe the snow was too deep? Or my stride was too short? Whatever the case, I plugged along for over a mile through the deep snow, just focusing on putting one foot ahead of the other (and not putting that foot in an XC ski rut!). The course finally turned onto a section of trail that had been travelled more heavily and was therefore easier to navigate. I remember calling out “THIS is more like it! 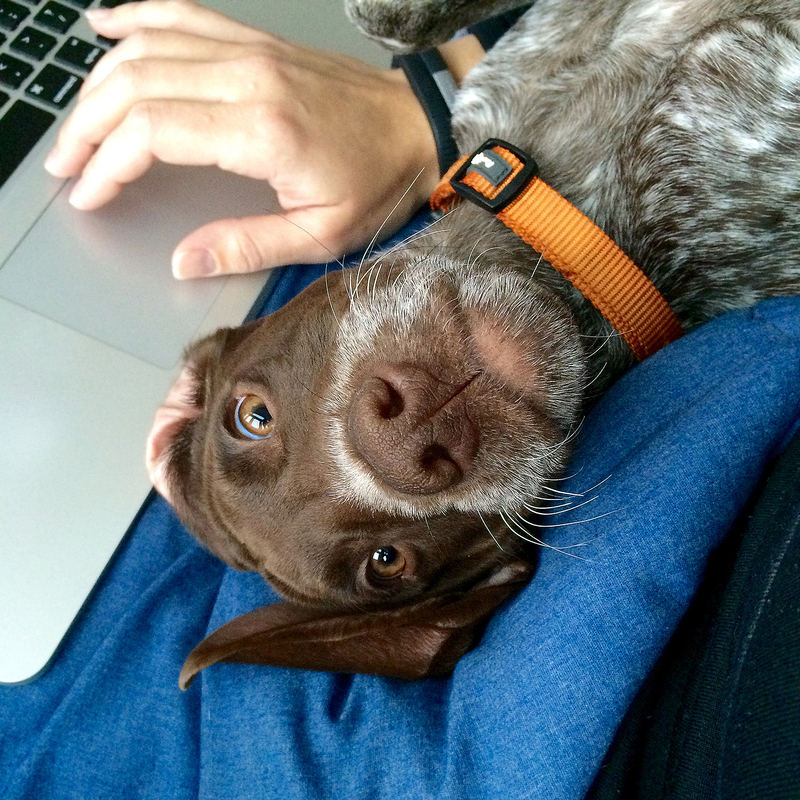 !” and hearing the guy behind me say “This is what I though the whole thing would be like!” Me too, buddy, me too! By that time my feet were exhausted, my left ankle was tender (crunched it inwards on one of those dang divots), and for some reason I kept accidentally kicking my right ankle/calf with my left Yaktrax-ed shoe. Oww! As a result I didn’t really pick up my pace on the smoother trail, but at least I wasn’t dodging ski tracks anymore. The course blissfully returned to pavement with 1/4 mile to go. I had been eagerly awaiting this moment and it felt amazing to finally have firm ground under my shoes. I picked up my pace and sailed into the finish, thinking that I was probably coming in at the 38-39 minute mark. Imagine my surprise when the clock said 50:22. Yes, it took me FIFTY MINUTES to run 3.8 miles!!! Holy smokes, no wonder it felt hard! After crossing the finish I looked down at my feet. The deep snow had caused my Yaktrax to slide completely over the toes of my shoes until the metal coils came to rest near my insteps. No wonder I kept scraping my right leg with my left foot! Luckily I only had a few scratches; no harm done. So about that 36 minute prediction… I was nowhere near my real time of 50:22. Most of that was obviously the snow, but I was also surprised when the course ended up being exactly the same as last year’s “3.8ish” course, not some different, shorter 3.4 mile loop as I had hope based on the race description. Oh well, at least it’s just a Pickle Run and all for fun anyway! 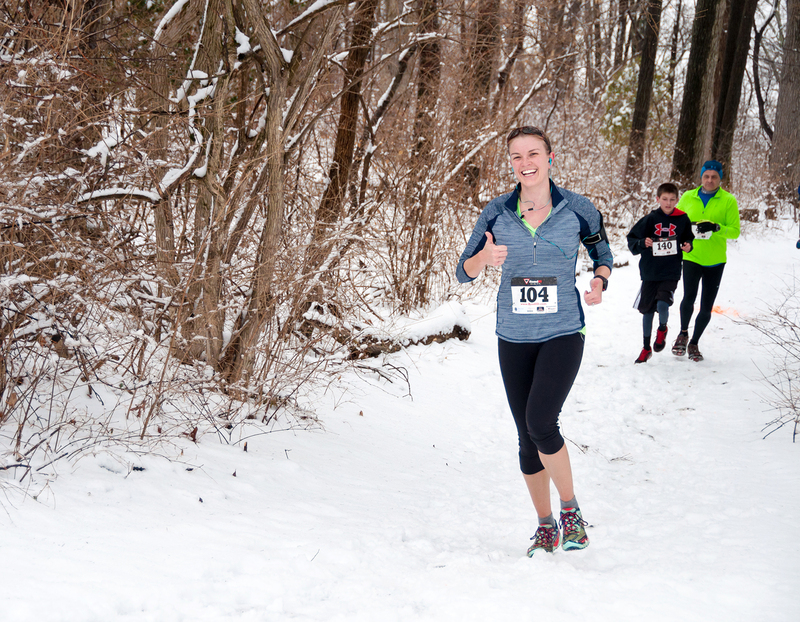 There are two more Pickle Runs this winter: one in February and one in March. I preregistered for all trail runs, but after January’s snowy experience I think I’m going to switch my February entry to the road. 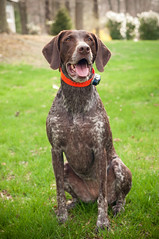 The good news is that if Piper and I keep doing short practice runs together my little GSP might be ready to join me for the road Pickle on February 20th… fingers crossed that that works out! Watch out February pickle, Piper’s coming for you! As I type this my little Piper pup is on the couch next to me, exhausted from today’s hiking adventures. She is sleeping on her back with her hind legs splayed open (she’s not the most ladylike puppy I’ve ever met!) and her breathing sounds like something between a snort and a snore. She’s been sleeping this way for at least an hour – a long time for a nap in Piper’s world! – so I’m taking advantage of this afternoon lull to do a quick photo post! Last Tuesday we got about an inch of snow in eastern Pennsylvania and I snapped some photos of Piper playing in the back yard on my lunch break. Piper seemed totally undeterred by the sub-freezing temperatures and had a blast romping around in the snow, chasing sticks and snatching up the occasional mouthful of snow… she loves this weather!! Happy Thanksgiving eve! It snowed in eastern Pennsylvania today. The snow might have been less than ideal for people traveling along the I-95 corridor for the holiday, but Matt and I were off from work and had a blast playing with Piper in her first snowstorm. 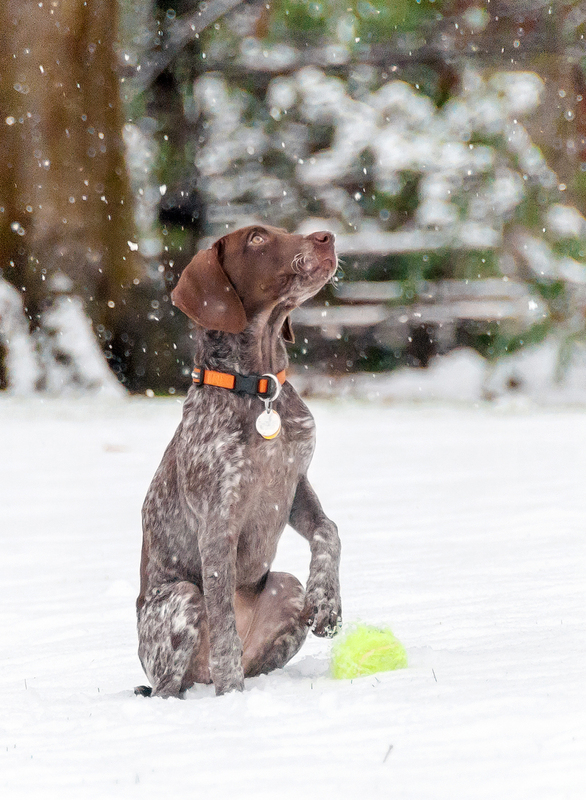 Piper took the snow in stride. She spent the first several minutes trying to eat the mysterious white stuff, then joined Matt for a slippery game of fetch. I snapped some photos as they played. After our playtime in the snow we went inside for hot cocoa (for us) and nap time (for Pipe). So far she’s been great about settling down for quiet snuggle time on the couch while we watch tv (or edit snow day photos). I’ll have to take a photo of her actually sleeping someday (my mom still doesn’t believe that Piper EVER sits still!) but for now I’ll leave you with this gem. I love this wacky puppy!